Cleanliness is essential for making advancement in spiritual life. There are two kinds of cleanliness: external and internal. 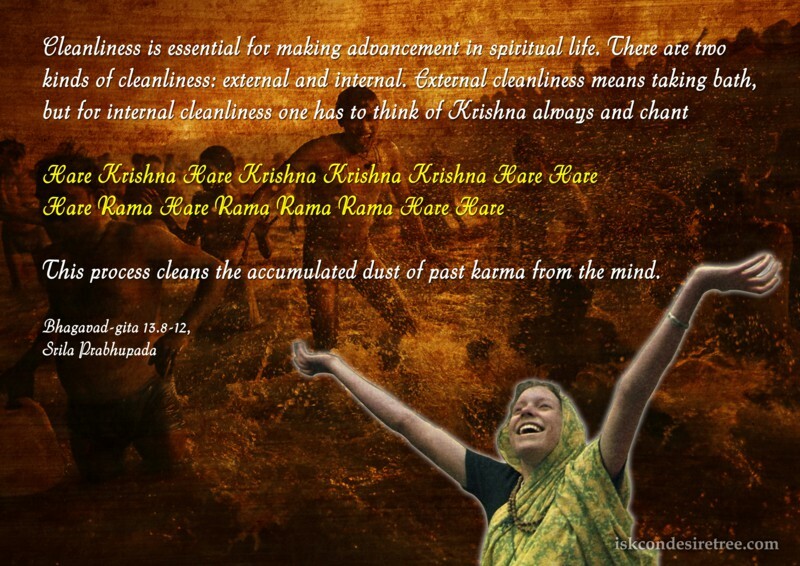 External cleanliness means taking a bath, but for internal cleanliness one has to think of Krishna always and chant Hare Krishna, Hare Krishna, Krishna Krishna, Hare Hare/ Hare Rama, Hare Rama, Rama Rama, Hare Hare. This process cleans the accumulated dust of past karma from the mind. A devotee should be simple and clean dressed, but more than dress, the mind should be clean. Do not condemn a dirty man, who is standing below a shower.